Captain Glazer of the steamboat, The Dakota Dawn, hires Clint Finnegan to become his second in command and to learn to pilot the dangerous snag-filled waters of the Missouri River. What Finnegan didn’t expect on his very first trip was to have the army payroll stolen and a beautiful woman kidnapped. Risking his life, he chases after the girl and the money, ultimately encountering angry plains Indians protecting their hunting grounds. From the blurb, and cover illustration, you’d be forgiven expecting a book set mainly on a riverboat. True a fairly lengthy first part of the tale is, and this contains some fascinating information about the workings of a riverboat, but once the payroll is stolen and the young woman kidnapped and the riverboat disabled the story becomes land-based and changes from a story of life on the river to a much more straight-forward western full of deadly, brutal action as Finnegan encounters Indians, deserters, and gunrunners in his quest to retrieve the stolen payroll and, more importantly for him, the abducted woman. The authors tell their tale from the point of view of many of the large cast of people, and at times Finnegan seems to become a secondary character but you know he’s there, in the background, never giving up his relentless pursuit. 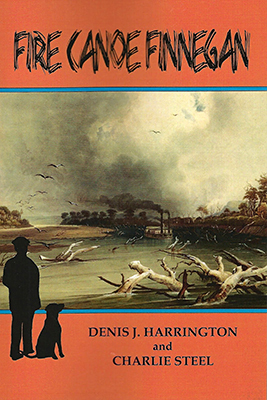 Sadly Denis J. Harrington passed away in July 2015, before the book he had drafted was published. Charlie Steel had already teamed up with Denis to add polish and historical detail to the manuscript and I must say he has done a fine job. Between them Harrington and Steel have come up with a very fast-paced tale that is extremely well-written making this a book all fans of westerns, and riverboats, will enjoy. 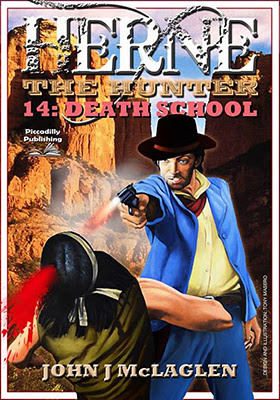 Death School is one of my favourite entries in the Herne the Hunter series and it is a book everyone who is following the series should not miss as we find out more about Herne’s past, his father in particular, and then there’s one of those killer kids who just may be….nope, I can’t reveal that here as I don’t want to spoil that storyline for those yet to read the book. The author hiding behind the John J. McLagen pseudonym this time around is Laurence James and as would be expected you’ll find many references to western films and people in the book industry at the time it was written, for instance two artists who painted many of the covers for the westerns from the group of writers to become known as The Piccadilly Cowboys, the artists being Chris Collingwood and Colin Backhouse. There’s also mention of two other western series heroes, Crow and Cuchillo Oro. Death School is a brutal book. Filled with hard characters, graphic violence and strong language. The five children will certainly remain in your mind for a long, long time after the shocking truth about them has been revealed as they led Herne into a deadly trap. The story has a very powerful and memorable dark ending, the type of conclusion that keeps me coming back to this series time and again.